Bingo Minions is a fun and playful site for everyone who enjoys bingo. The website has a number of games and features to enjoy along with various promotions. A number of people are playing on Bingo Minions and with so many exciting features to enjoy, it is clear to see why! 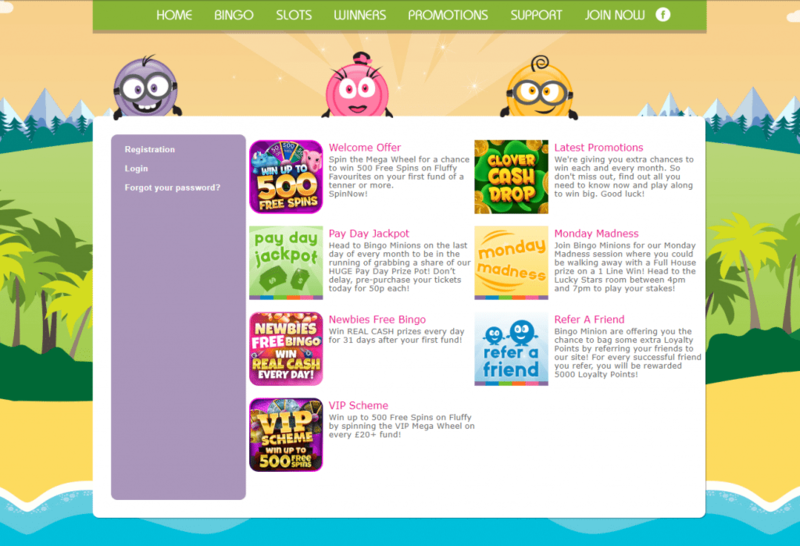 When you first sign up to Bingo Minions you will be welcomed with a free bonus offer on your first £10 deposit. You will also receive a free spin of the wheel allowing you to win an extra prize. With so many added bonuses just from making a small first deposit, it is no wonder why so many people are signing up to BingoMinions.com. This site has taken the steps to build loyalty with a slew of promos and bonuses. For starters, the welcome offer loads accounts with free money. They use creative and funny themes to keep things engaging for guests. Some examples for first-time player are newbies free gaming and free minion charm pendants. Bonus codes are not needed for perk as the game automatically whisk players to a special area. There is also no requirement for promo codes to take advantage of the monthly promotion. The internet has created a space for all types of gaming opportunities that include bingo, online slots, scratch tickets, and table games. Bingo Minions is one with a short registration that takes less than five minutes. Players will find plenty of special games such as those with a variety of jackpots and tournaments. The login process is simple with instant access to exciting game options. The website home page has a window to display the day’s hot promotions. Next to this section, the most recent winners are showcased by screen name and the amount won. A loyalty program rewards regulars by giving them £1 cash for every 1,000 points earned. They will be added to the player’s account after redemption, but cannot be withdrawn. With 15 sister sites available, the action and loyalty points is never-ending. Those looking for a fun atmosphere with a signup Bonus, promotions, and a diverse selection of games to choose from, will be impressed. Each month Bingo Minions offers a new game with different winning amounts. Terms and conditions are listed immediately below the advertisement after players click the link. No free Bets exist in any game on the site. However, you shall find free spins on a special wheel after the registration and first deposit. Players can win a guaranteed payout between £5 and £2,500. Friday Night Takeaway gives winners as much as £50 in both the 75 and 90 ball games. In an effect to start the week off with excitement, Monday Madness is held in a room called Lucky Stars from 4pm to 7pm. The last day of the month is known as Pay Day Jackpot with six winning opportunities that earn winners nearly £2,000. You’ll find numerous promotions to be enjoyed at BingoMinions.com including Monday Madness, Friday Night Takeaway and Weekend Wad. Each promotional game offer some fantastic prize money. You can also enjoy free bingo if you are a newbie. The Newbie Freebies are available for the first 7 days after signing up and it is a great way for you to earn some extra bonus money. Jumpman Gaming uses an agile platform that has been tested by SQS. They validate software operations with their seal of approval so gamers are confident play is fair. There are several ways to reach support should issues arises including live chat, real-time presenters, and a dedicate customer service email or phone number. Bingo Minion has made the steps seamless by requesting basic info such as name, date of birth, and email address. This is followed by creating a username and password. Players can fund their accounts using popular options such as Visa debit, credit, or electron. For more convenience, MasterCard, Solo, and Maestro are also accepted. Making a deposit begins after login from the game lobby. Visitors simply click the make a deposit button or for withdrawals the make a withdrawal button on the left-hand side of the screen. First and subsequent deposits have minimums ranging from £5 to £10. Deposits are posted immediately. There are also minimums for withdrawals in the amount of £30. It takes 48 hours for withdrawal requests to complete and another seven to 14 days for it to be deposited to the credit card of choice. This game can be accessed on mobile devices including smartphones on the iOS and Android platform. A mobile-friendly app can start play as quickly as the desktop option. The experience is responsive with crisp graphics and sounds. All the same convenient options, promotions, and games are available. In summary, you are sure to enjoy Bingo Minions so make sure you get past the login and sign up today.